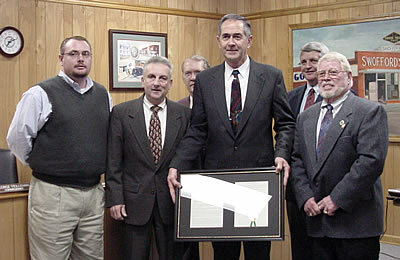 Now, therefore, be it resolved, that Sheriff T. Ray Warren, a dedicated public servant, has been, and will continue to be, a pillar of the Taylorsville Community through his recognized leadership in the public sector, we, the Town of Taylorsville Board of Commissioners hereby present this Distinguished Public Service Award for his outstanding service and dedication to his fellow man and the same is by motion duly, passed, and recorded upon the public record of the Town of Taylorsville, North Carolina. Further, this Award conveys the Town of Taylorsville’s best wishes for the future with his wife, Iran. Adopted this the Third day of December, 2002.